After leaving school, I decided to do nursing. As a country girl from Tumut, NSW there were opportunities to train in hospitals near home. But my mind was made up to come to Sydney and train at St Vincent’s Hospital, Darlinghurst. I thought it was important to train at a large Catholic Hospital. My four years of training were challenging and care-free. The Sisters of Charity tried to “tame” the girl from the bush. On completion of my training in 1960, I knew I had to make a decision regarding my life in the future. To the surprise of everyone, I decided to join the Sisters of Charity. My thinking was that they would give me six months and I would probably be asked to leave. My philosophy of life is to give, but in my own style. This way enabled me to serve all with great freedom of spirit and faith. It created many challenges in my life as a Religious. After 63 years, I am still marvelling at the many opportunities I have been given to do this. I have had many roles including emergency nursing, intensive care and surgical nursing. I was allowed to do midwifery nursing at Queen Victoria Hospital in Launceston on 1972. During my midwifery, I commenced the Licentiate in Hospital Administration which I completed in 1977. This was done by remote learning from UTS. After Tasmania, I was sent to Melbourne where I did my nursing administration at the Royal College of Nursing in Melbourne and then worked at St Vincent’s Hospital. 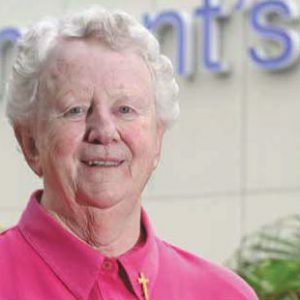 In 1977, I was asked to go to St Vincent’s in Toowoomba where I was responsible for the convent, the nursing and hospital management for 10 years. In 1987, I returned to Melbourne to manage St Vincent’s Public Hospital until we turned over our management to lay staff in 1992. In 1993, I had a year off with six months spent at Mt Olivet in Brisbane working with staff and preparing this wonderful place for accreditation. In September, I went to Dover near Boston, USA for a spiritual renewal for three months. In 1994, the CEO of St Vincent’s Hospital, Darlinghurstasked me to return and set up a patient liaison role. I am still doing this and spend my days helping staff, patients, and their families. The systems in a hospital are complex and I am ever grateful for my past experiences when helping these people. I am one of the oldest registered nurses around; this is necessary as I am often advising in a clinical area. Mediating with patients, their families and staff can be very demanding. My other great love is to help priests and Religious from Papua New Guinea, Kiribati and Fiji when they have health issues. Many “miracles” happen as a result of the generosity of the doctors and hospital staff. They have no means and we are able to restore all to a good quality of life. To sum up, my commitment made in 1962 – entrance date – has been challenging, tough but very rewarding. The mission and values have been my support all these years. Would I do it again?